Gettysburg Licensed Battlefield Guide Fred Hawthorne is standing on East Cemetery Hill in front of the water tanks of the Gettysburg Municipal Authority. 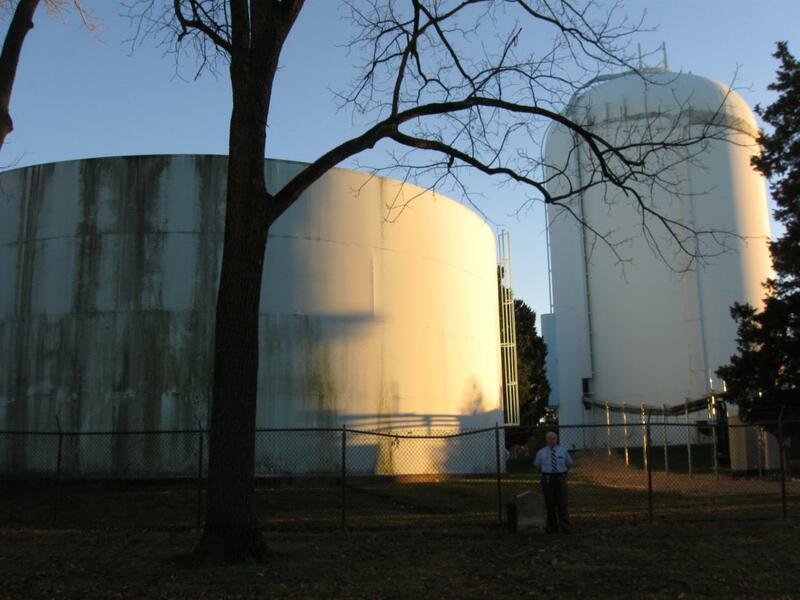 The large water tank on the right is the “landmark” tank to help individuals know the location of Cemetery Hill. Fred is standing by the left flank marker for the 107th Ohio Infantry Regiment. This view was taken facing southeast at approximately 4:45 PM on Friday, November 12, 2010. In the fourth 140 Places post, Gettysburg Licensed Battlefield Guide Fred Hawthorne showed us where George Washington Sandoe fell and was buried, and provides us new information on the A.L. Coble rock carving. 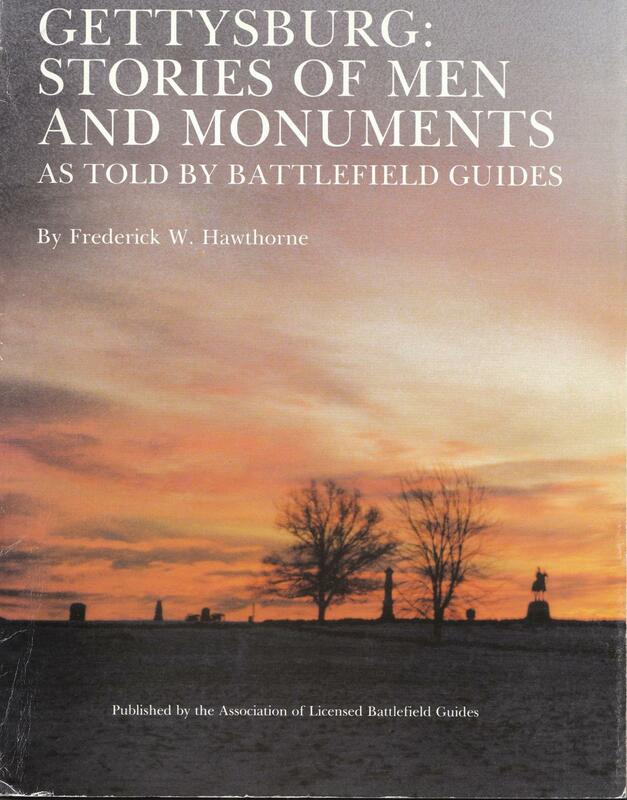 In the fifth 140 Places post, Gettysburg Licensed Battlefield Guide Fred Hawthone showed us the Hampton Battery Rock and the graves of soldiers in Evergreen Cemetery who were buried by Elizabeth Thorn. 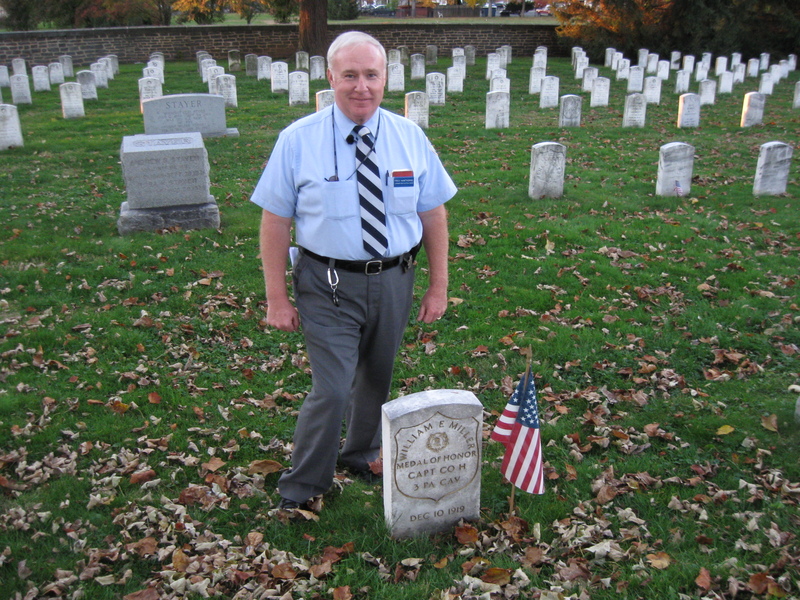 In the sixth 140 Places Every Guide Should Know post, Gettysburg Licensed Battlefield Guide Fred Hawthorne showed us the grave of Lieutenant Colonel Emmor B. Cope, and the three burial places of Jennie or Ginny Wade. In today’s 140 Places Every Guide Should Know post, Gettysburg Licensed Battlefield Guide Fred Hawthorne shows us some rarely seen Ohio flank markers on Cemetery Hill, the burial location of Confederate remains stored in the Rosensteel Museum and those found in the railroad cut, and the grave of Medal of Honor recipient William Miller. This map shows us the locations taken of the videos for the 140 Places Every Guide Should Know series. Videos #1-#17 were shown in our previous 140 Places Every Guide Should Know posts. Video #13 was taken at the Hampton Battery Marker on Cemetery Ridge. Video #14 was taken by the Hampton Battery Rock. Video #15 was taken in Evergreen Cemtery where Battle of Gettysburg casualties were interred by Elizabeth Thorn. Video #16 was taken in Evergreen Cemetery at the grave to Emmor B. Cope. Video #17 was also taken in Evergreen Cemetery at the grave of Mary Virginia “Jennie” Wade. 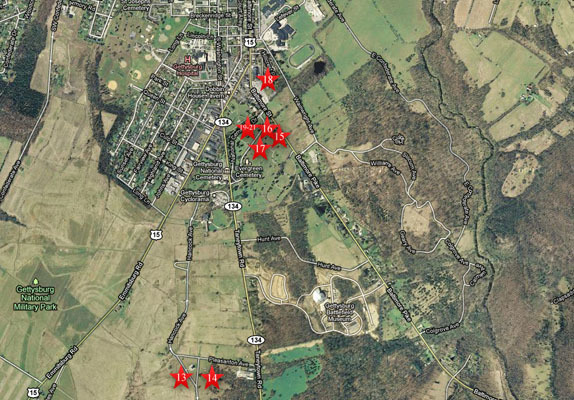 Video #18 was taken by the Ohio flank markers on East Cemetery Hill. Video #19 was taken in the National Cemetery by the right flank marker of the 61st Ohio Infantry . Video #20 was taken by the burial locations of the unknown Civil War remains stored in the Rosensteel Museum and those found in the railroad cut, and now in the National Cemetery. Video #21 was taken in the National Cemetery by the grave of Medal of Honor Recipient William Miller. This map was created facing north at approximately 3:30 PM on Saturday, December 18, 2010. 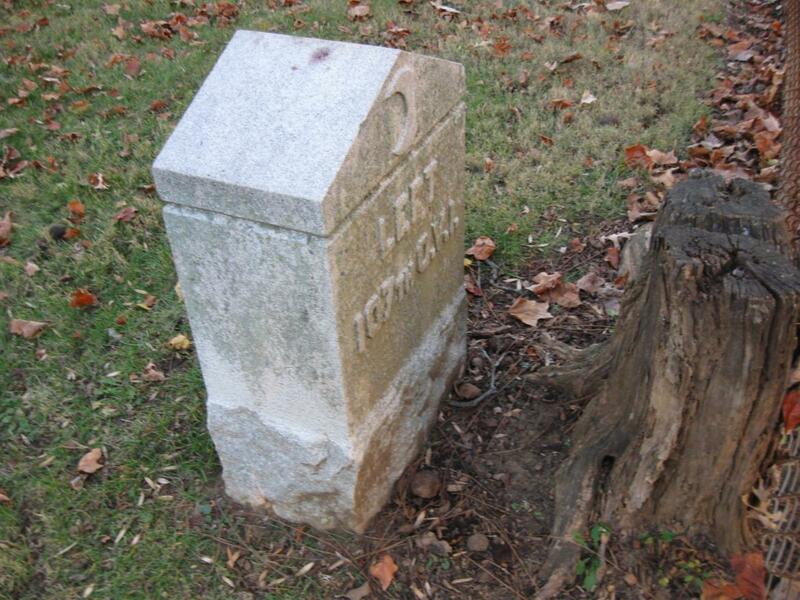 The left flank marker of the 107th Ohio Infantry Regiment. To the right of the stump is the chain link fence marking the boundary of the property of the Gettysburg Municipal Authority. This view was taken facing northeast at approximately 4:45 PM on Friday, November 12, 2010. In Video #18 (Videos #1-#17 were shown in our previous 140 Places posts) Gettysburg Licensed Battlefield Guide Fred Hawthorne is standing on East Cemetery Hill near the left flank marker to the 107th Ohio Infantry Regiment. He shows the location of other Ohio flank markers in this location which your “average” visitor to Gettysburg rarely sees. This view was taken facing southwest to northwest to southwest at approximately 4:45 PM on Friday, November 12, 2010. Gettysburg Licensed Battlefield Guide Fred Hawthorne is standing on East Cemetery Hill near the left flank marker to the 107th Ohio Infantry Regiment (out of sight on the right). 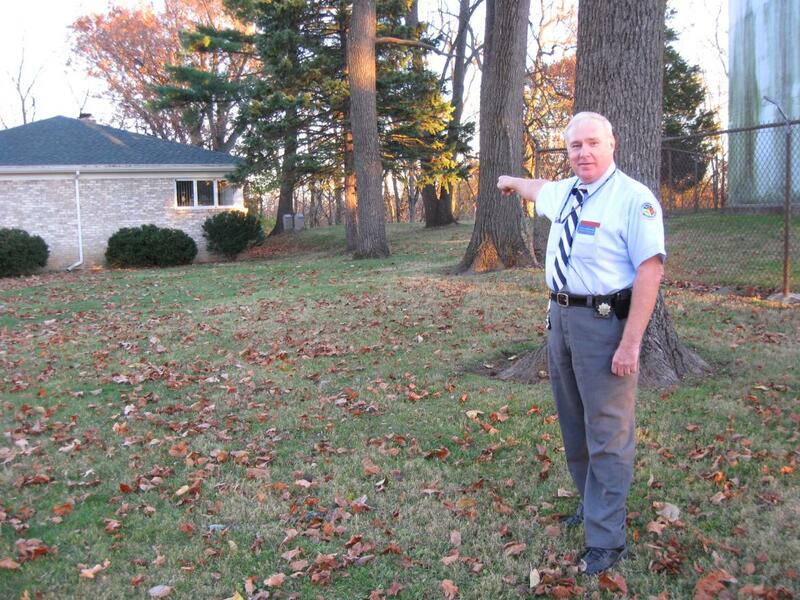 He is pointing behind a private residence to the right flank marker of the 107th Ohio and the left flank marker of the 25th Ohio Infantry Regiment. This view was taken facing east at approximately 4:45 PM on Friday, November 12, 2010. 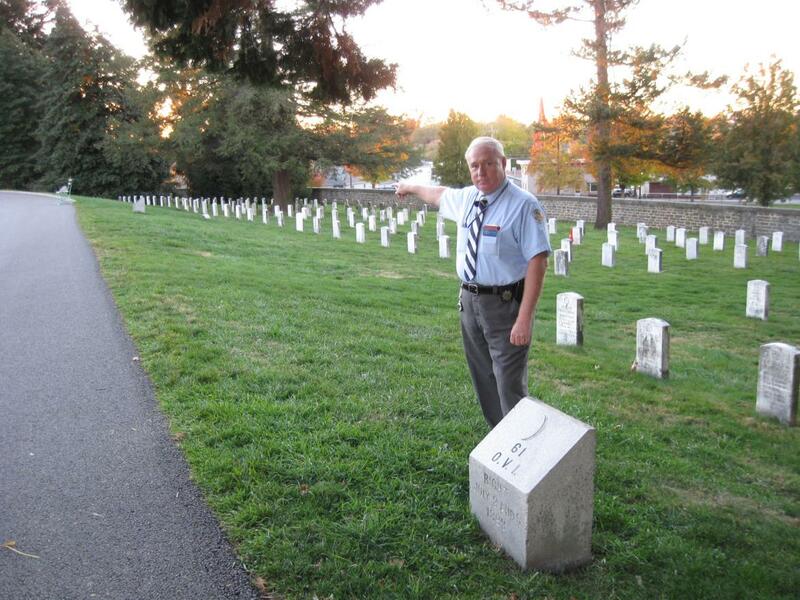 Gettysburg Licensed Battlefield Guide Fred Hawthorne is standing in the Soldiers National Cemetery by flank markers that thousands of Gettysburg visitors see, but probably think are headstones. Fred is standing by the right flank marker of the 61st Ohio Infantry Regiment, and is pointing to the left flank marker of the 61st Ohio Infantry Regiment. This view was taken facing southwest at approximately 4:45 PM on Friday, November 12, 2010. In Video #19 Licensed Battlefield Guide Fred Hawthorne shows the location of some flank markers in the National Cemetery. This view was taken facing north to northeast to southwest at approximately 4:45 PM on Friday, November 12, 2010. Licensed Battlefield Guide Fred Hawthorne is in the Gettysburg Soldiers National Cemetery. The “Unknown Civil War Remains” maker denotes the location of Confederate remains that were kept in the Rosensteel Museum until they were buried here. This site also contains the remains of a soldier found in the railroad cut in 1995. In the right background is a portion of the base of the New York State Monument. This view was taken facing east at approximately 4:45 PM on Friday, November 12, 2010. 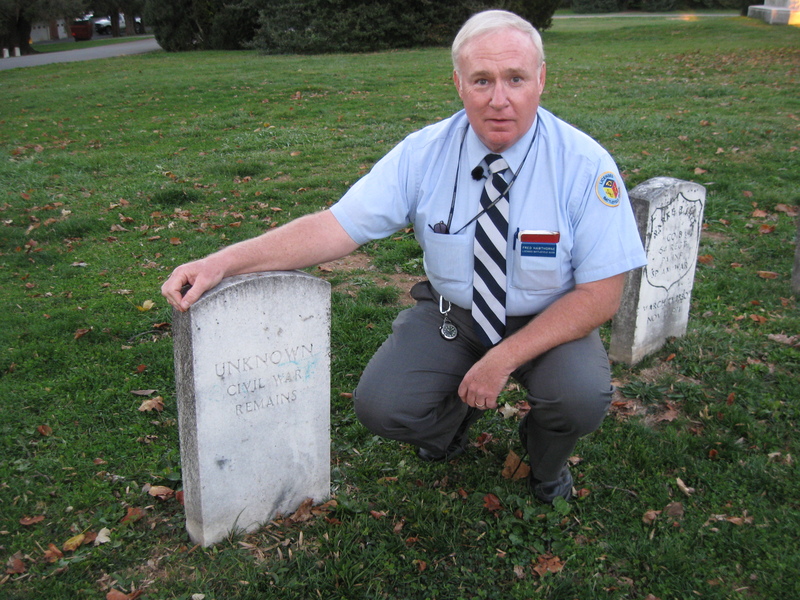 In Video #20 Licensed Battlefield Guide Fred Hawthorne shows the location where Confederate remains found in the railroad cut in 1995 are buried in the National Cemetery. This view was taken facing east at approximately 4:45 PM on Friday, November 12, 2010. Fred Hawthorne is standing in Section 2 of the Soldiers National Cemetery near the headstone for William E. Miller. Miller is the only Medal of Honor Recipient for the Battle of Gettysburg who is buried in the Gettysburg National Cemetery. This view was taken facing northwest at approximately 4:45 PM on Friday, November 12, 2010. In Video #21 Fred Hawthorne shows the headstone for William E. Miller, the only Medal of Honor Recipient for the Battle of Gettysburg who is buried in the Gettysburg National Cemetery. He explains the action on East Cavalry Field that led to Miller’s being awarded the Medal of Honor. This view was taken facing northwest at approximately 4:45 PM on Friday, November 12, 2010.